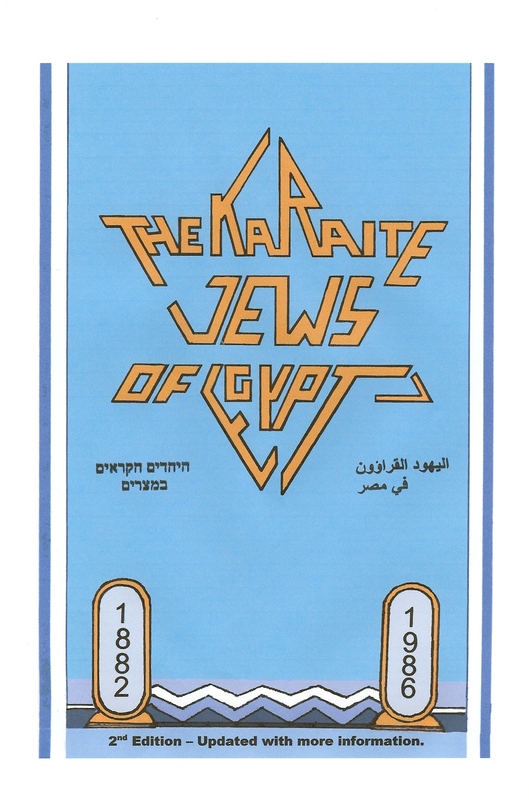 Mourad El-Kodsi’s Classic Book describes Karaite Jewish Life in Egypt. I’ve made several confessions on the blog. I’ve admitted that I lied to a rabbi. I’ve acknowledged that I support the Rabbanut. I’ve told you that shawarma is unbelievably good (even though it is almost never kosher). And now I’m going to make the biggest confession of them all. I was once a Neo-Karaite. And I don’t mean the good kind. 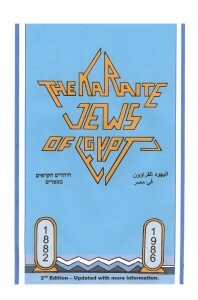 one who has very recently adopted Karaite Judaism as the preferred form of Judaism. When I was a Neo-Karaite, I was guilty of many things, including being a jerk and exhibiting a complete lack of humility. In college, I was rediscovering my Karaite Jewish identity. And every Friday before Shabbat, I would email my friends and family about something new (and in my opinion truly awesome) I had recently learned about why the Karaites were right and the Rabbanites were wrong. This continued for weeks until one of my college classmates (a Jewish girl I had met in Hebrew class), sent me a very direct email. In essence, she asked me why I was so angry. Well, not in essence, those were almost her exact words. Until that moment, I had no clue that my zeal to spread the truth about Karaite Judaism was actually turning people off. It turns out that people like you and your message a lot less when your message is laced with sour grapes. It didn’t matter how much my friends and family loved me or agreed with Karaite Judaism. They didn’t want to join my cause, because they rightly could not stand being around me. As a friend of mine pointed out recently, one of the main problems that Karaite Judaism faces is that people misunderstand the fundamental tenet of Karaite Judaism: “Search the Scripture well and do not rely on my opinion.” These words are not intended to promote anarchy or irreverence. Nor are they intended to reject outright the commentary or opinion of man. The fundamental tenet of Karaite Judaism is an admission of humility, an understanding that we do not have all the answers. Even the most Karaite Karaite of them all, Daniel al-Kumisi, who famously proclaimed “[a]ccept nothing from any man,” wrote several commentaries on the Tanakh. So he clearly was not advocating that people refrain from reading the opinion of man. And underscoring the importance of being humble, after zealously advocating his position, Kumisi told his readers to look at the Scripture to reach their own conclusions. All observant Jews seek to give honor to Hashem. And Karaite Jews seek to do this through the framework of our fundamental tenet. But as we do so, all Karaite Jews (both historical and new) must actively promote a welcoming and humble environment. I admit this is not easy. But I trust we are all up to the challenge. See Leon Nemoy, The Pseudo-Qumisian Sermon to the Karaites, Proceedings of the American Academy for Jewish Research, Vol. 43 (1976) p. 56. It is a truly humbling experience to realize that few, if anyone, have any interest in the same exact pearls of truth as are so valuable to me… It is even more of a humbling experience to realize that my way of presenting to my friends the valuable truths that I am discovering from time to time, is a turnoff to them, and that I am the cause for making my friends even less interested. May YHWH grant me the wisdom to discover my errors and how I can remedy my way of coming across! Nice, Eddie. I cannot wait for your coffee table book on the subject. Frankly, I began reading this blog intently, as I expected you to report about an attempt to confront Nehemia Gordon’s loyal henchmen at the KJU… I know of two individuals who have retreated from Qaraite Judaism because of some things those folks have done there . For example, the Gordonite KJU teachers forbid students to write and say “Hashem” and force them to use only the “Yehovah” spelling and pronunciation for the Tetragrammaton, because this is Nehemia Gordon’s pronunciation of the Name and because NG linked the word “Hashem” to the Mesopotamian deity “Ashima”, even though this linkage is devoid of any solid linguistic sense and is therefore untenable. How much longer and how much more damage are the interests and reputation of Qaraite Judaism condemned to suffer because of such outrageous antics by Gordon’s minions? *Small correction*: I have just been told that the Gordonite teachers do not forbid students to use other spellings for YHWH’s Name, but they do present ‘Yehovah’ as “the truth”. Nehemia Gordon is not involved in the KJU. And I remind you that this is intended to be an uplifting place to discuss Karaite Judaism. And lashing out at people (the henchman, as you call them) is exactly what this post is trying to dissuade. Zvi, I believe you are mistaken that their are followers of Nehemia Gordon much lest thuggery of forcing people to say a certain pronunciation of the name of our Elohim. There are 4 people who teach at the KJU and they are Hakham Meir Rekhavi, Rabbi Rashi Moshe Firrouz, Dean Daniel Ben Immanuel and myself (Yohanan Zaqantov). So which of these are the Gordonite teachers? Shalom Yoḥanan. Since you pressed the issue despite Shawn’s wish that all references to the matter cease, it is the man before you. Unfortunately, I am not mistaken because I am speaking on excellent authority. Even if you deny my charges and the fact there is a Gordonite teacher, this will not change the facts. Fortunately, Ḥakham Meir is now aware of the charges and is possibly dealing with the situation. Gordon’s supporters can fume all they want, but that sort of behavior must be eradicated. And hopefully YHWH will partake in its elimination. Great post Shawn Lichaa! I often find myself being a bit too zealous in my approach, and having to remind myself to turn it down a notch. One of the verses I have to recall in these moments is Psalm 111:10. Reishit Hakhmah Yir’at YHWH. The beginning of wisdom is being in awe of YHWH. Hi Elie… I think we met at the synagogue compound in Yerushalayim on one of the Feasts last year, although the guy could have been someone else who looks like a darn near replica of you; as soon as you or he saw me, you/he called me “John” as if he/you could not distinguish between me and Jonathan Daire. Let me ask you a question about Gid haNashe (usually translated as the sciatic sinew or tendon); this is even more fitting since you have recently done a video presentation about Qaraite Sheḥiṭa, namely slaughtering. The traditional Qaraites argue that the Torah’s reference to the Israelite tradition of refraining from eating Gid haNashe until the day this story was placed into the Torah’s Text effectively elevates it to the level of a Miṣwah, a commandment. I and others, including some who consider themselves Qaraite, have found through their critical thinking that the Qaraite reasoning is uncompelling and does not fit the Peshat. Why, then, do the Qaraite rabbis and slaughterers in particular not concede in every possible opportunity or outlet available to them (including teaching sessions for Qaraite youth) that they are not necessarily correct in forbidding or preventing the consumption of Gid haNashe on the part of non-Rabbinic Jews, and that they should allow each Jew with access to meat slaughtered by them to choose whether or not they will consume Gid haNashe? I fervently believe that such moves by them will register as an enormous degree of progress. Hi Zvi, I think that you have mistaken Eli Shemuel for Elie Mangoubi. Mr. Mangoubi lives in Chicago. By the way, I think the most likely interpretation of that verse is that the Gid Hanashe (whatever it is) is not forbidden. I apologize to Elie Mangoubi for the emotional imposition my response to his comment has caused. All of this begs the question, “why do the Qaraite slaughterers and rabbis of the 21st century still forbid what is permitted?” I feel personally offended that my right to choose is not respected, especially being that we are not led by the Kehunah (Priesthood) and true prophesy has not restarted yet, and I am the bearer of the consequences of such choices I make. The truth is not welcomed. It is hard for people to be put in a situation where they have to choose to their loyalties to Hashem, or to the beliefs they were born into, or the people near them and their religions. It is a hard and lonely road to be a questioner, and it’s hard to not share when you’ve discovered you’ve been lied too. I have to say the truth… Wise in my own understanding, or looking for truth? Only Yahovah knows. Shawn! As usual you hit the nail on the head! When I first visited the Schul in Daly City I was disillusioned with the Rabbis and felt slightly betrayed. I had just discovered that I agreed more with the Tsadokim (who had always been demonized in the learned I had done up to that time). I spoke with Eleazar and he shared my anger and betrayal. He also showed me a positive outlet for that anger: learn and grow into Karaism. It took a couple of years for that to wear off, but by the time of the KJU ceremony in 2009 I had begun to ask my teachers this fundamental question: Why do we spend all our time talking about how we are not Rabbanim, how wrong and backwards they are, and how right and great we are? First of all, such a message is rather lost on people like my wife who grew up with Christianity and have no reason to be upset with the Rabbis. Second, we should talk about who we are and what we do with pride but not to the detriment of others. I took this more gentle approach and found it helpful. Indeed, as you point out, like our Rabbinical brethren we see the value in learned commentaries. If I gain knowledge in scripture why hide it? Why not record it and pass it down? What would we have lost were it not for Qirkisani, Kumisi, and HaDassi? (Among so many others). When I studied at yeshiva in Israel I omitted my Karaite beliefs from conversation not so much to deceive, but because when I had mentioned it to Talmudic scholars before they focus all of their time on why I should accept the authority of the Rabbis, rather than on studying their interpretations. Since arguments in favor of Rabbinical authority are lost on me anyway, that would have been a waste of time. In my studies I was surprised at how much I agreed with Mishnaic commentaries and those of Rashi and the Rambam. Yes, I had studied their works before, but I had largely disregarded their works when I moved to Karaism. By making an objective study of their commentaries I was able to see where I agree and where I think they go wrong. It was surprising to me the interpretations I find to be faulty and why these days. In older times I might have said “well if a Rabbi wrote it they must be wrong.” Now I read and learn and I explore their opinion. Obviously, their interpretations are not laws and neither are those of Qirqisani but when you give them all the equal weight of human commentary, they take on new meaning. I have also been surprised when I studied with the Karaites in Israel, as well as with the Shomronim, how wrong I was in some areas. There were interpretations and approaches I thought I had studied well and made a strong case for, that turned out to be just plain wrong. Learning from them also gave my thoughts greater depth. I returned to the states more certain that I am a Karaite Jew through and through, that I have much yet to learn, and that there is a degree of via media (the middle road) between Karaite and Rabbinical thought that allows both communities to study and grow together. I have been a much happier person, a better Jew, and a more productive member of the Jewish community since I, too, departed neo-Karaism. I appreciate this post, it is very much in line with my way of thinking. I wonder if this isn’t just normal human behavior; if it isn’t just part of the stages that we go through in life. I did this when I discovered that Judaism was right and my former belief system (Christianity) was wrong; and I find that I tend to fall into that trap with every new discovery along my way in life; albeit (hopefully) less, and less so. In addition, I have noticed a lot of others doing their own version of this behavior. For anyone who doubts the existence of modern miracles, this article is proof that Shawn is both honest and succinct, despite being an attorney by trade. Shawn, congratulations on another excellent piece! There are 2 related extremes. One extreme is to pronounce your view is right and everyone else as wrong. The other extreme is to express no opinion at all for fear of offending someone. Both extremes share a common principle which is that conflicting opinions can’t be tolerated. And this principle is supported in Christian cultures where, if 2 people disagree, then one must be a heretic. American culture today reflects this with its extreme politically correct intolerance of unusual views. To avoid offending Americans, one must conform to the second extreme of expressing no opinions at all. Because of this, I hate American culture. I support the Jewish way of allowing open debate. I will never say “you are wrong and I am right”. But I will often say “I disagree with you because … but I still respect your view”. Any religion that tries to appeal to mainstream Americans will lose its soul because it will have to give up any serious positions. Much of the Tanakh would be considered hate-speech by modern American standards. A successful religion must offer a clear alternative to modern culture. Islam does this quite successfully, and I would love to see Karaite Judaism do the same.